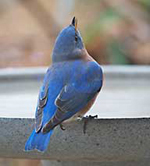 Seven eastern bluebirds visited the birdhouse this morning. How sweet, I thought, the family has come back to visit where the young were hatched this summer. But their mission was not all sweetness. 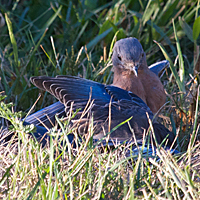 The bluebirds flew at one another, collided, tumbled to the ground and grappled. Males fought males, while females stood by and watched, like school kids streaming to a playground fight. 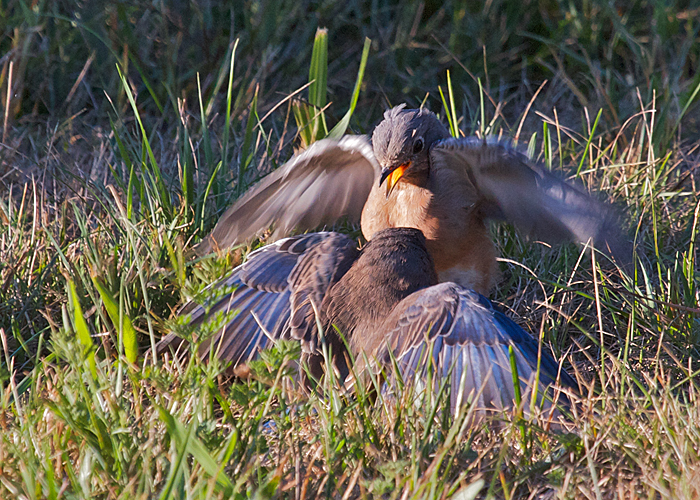 Above, two females do battle. Why? Perhaps for ownership next spring of a certain birdhouse. Below, one male manages to hold the other one down. I think he was standing on his rival's neck. Tempt your bluebirds to come up close. 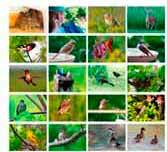 Offer them live mealworms. This mealworm feeder will outlast wood. Made of recycled plastic. 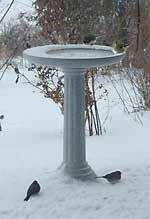 Put a few mealworms in each day, and your bluebirds will quickly learn this is their own feeder. Amazing way to make friends with bluebirds. The heating element is built in. The cord plugs in from inside pedestal.